Peter Watchorn and Mahan Esfahani have a delightful lightness of touch on this, the first, volume of the complete keyboard music of the very English composer, John Bull. (His name in England is still that used to personify the English spirit – after its creation John Arbuthnot in 1712.) 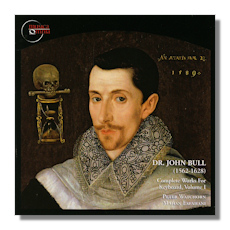 Our John Bull lived from 1562 to 1628 and was thus a close contemporary of Shakespeare and Byrd. But he's a composer too often overlooked in surveys of the period. The events of Bull's life are not well known; indeed, in some ways he's a bit of an enigma. His career (divided initially between Hereford and London) was not that atypical of a thoughtful musician in times of religious and political upheaval… cathedral, university and the Chapel Royal. After a somewhat tempestuous relationship with successive English establishments, Bull was probably obliged to leave England for good in 1613 as a Roman Catholic recusant. He spent the last 15 years of his life in exile. His existence in Antwerp is known to have been precarious and involved somewhat contentious episodes in relation to his employers. But – like many Catholics in exile in the more tolerant Netherlands – he survived to write profound and beautiful (keyboard) music, something (one senses) that he continued to want to do regardless of circumstances. Indeed, these CDs are remarkable and thoroughly to be recommended (even if there were not almost nothing in the current catalog dedicated to Bull's keyboard works) because Watchorn and Esfahani (whose playing styles are very similar) successfully and convincingly blend Bull's dry but at times passionate drive to communicate and express pain, loyalty, resentment, attachment and an inevitable sense of exclusion. Their playing suggests a confidence born of being in the minority. On the one hand theirs is a technically "quiet" and unassuming (though never deferential or tentative) touch. On the other it's forthright and open, conveying conviction and faith – which must mirror how Bull saw his world. The result is that we respond to the very essence of what was evidently important to Bull. We know he did compose vocal music, and can assume that some of his keyboard works (for which he usually failed to specify an instrument… organ, virginal, harpsichord) were lost in his flight to the Low Countries at the age of 50. The achievement of the two players we hear on these two CDs is to convey clearly, yet without undue interpolation, not just the strength of Bull's personality; but much of that personality itself. Repeated and careful reference to the works presented here (each one is illuminatingly described in the liner notes) suggests that Bull was indeed a forceful and self-assured character. He was rarely content to develop a musical idea for anything other than principled and sincere reasons, yet not in ways that their extra-musical significances could confuse or distract. On the other hand, it's plain that his music served his religious beliefs in ways with which nowadays it's hard to empathize. Watchorn and Esfahani bring out that certainty without suggesting arrogance through intelligent use of tempi, phrasing and a superb awareness of the structure of each piece. In other words, Watchorn and Esfahani present more than a collection of pavans and fantasias as a serendipitous taste of a lesser-known composer. Nor a "portrait" effectively looking in at its subject. Their collection of almost two dozen pieces ranging in length from barely one minute to well over seventeen succeeds first in situating each… as a heart-felt tribute to someone whom Bull admired (not owed something! ); or as a reflection on the composer's own grief (where it's quietly justified, and not indulged); or full of resonances like "Walsingham" suggesting more to contemporaries than we can imagine now. This is an insight into Bull and of his works. But one that more than incidentally brings his world into sharp relief; it unselfconsciously knits together background (bells and folk song, for example) context and the highly individual inspiration of Bull. The pace and dynamic variation employed by the harpsichordists does more than support and suggest this richness; it illuminates and somehow authenticates it. Exemplary. The recording is close, intimate and present; there is little reverberation: the recording was made in St. Mary of the Hills church, Milton Massachusetts using a ¼ Comma Meantone of Watchorn's own. This adds to the immediacy of the impact of the music and allows us to treat it as a recital and not a spectacle. To appreciate, in other words, the music on its own terms without interfering effect. Three harpsichords (reproductions of a Hans Moermans of 1642, and after the same maker in 1584; and rebuilt [in 1756 by Blanchet] Ruckers of 1646) are employed. There is a very informative booklet that comes with the CDs. This is a high standard of music making, well focused and affording great pleasure to listeners. More than merely worthy of being the only current survey of the repertoire, these CDs represent a very welcome start to what promises to be a highly desirable series.